Here is an issue that is currently floating around the blogosphere. If we look at post-World War II aggregate data, a standard business cycle regularity is that deviations of average labor productivity from trend are procyclical. 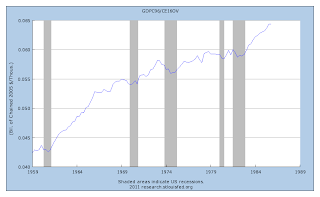 For example, suppose we focus only on the period from late 1950s to the late 1980s, and use the ratio of real GDP to employment (household survey) as a crude measure of aggregate labor productivity. In the first chart, we see that average labor productivity is typically lower at the end of NBER recessions than at the beginning. Now, in terms of the macro models that people were working with in 1990, this regularity might be seen as being consistent with the predictions of real business cycle (RBC) models, and inconsistent with Keynesian models. Indeed, unless total factor productivity (TFP) is falling in a recession, average labor productivity has to increase. One response to this is (was?) that labor hoarding is an important phenomenon. In a recession, if a particular firm has previously invested a lot in the firm-specific human capital of its work force, it will be reluctant to lay off those workers. In the interest of the long-run profitability of the firm, the firm might choose to keep workers on its payroll and not ask them to do much, rather than lay those workers off and potentially lose them forever. With labor hoarding, actual labor input can fall without measured labor input falling. Indeed, if we measure TFP using the Solow residual, we may observe the Solow residual falling when actual TFP is not falling. I'm not sure how these issues sorted themselves out in the literature (if at all), but certainly Keynesians and non-Keynesians were writing about it. Next, if we look at more recent recessions, focusing on the period from 1990 until now, the pattern changes (see the second chart). In the three most recent recessions, average labor productivity is higher at the end of NBER recessions than at the beginning. This is particularly pronounced in the most recent recession. Indeed, in the last quarter of 2010, average labor productivity is about 6% higher than at its lowest point during the recession. What is going on here? In the blogosphere, Brad DeLong shows us some plots of unemployment and productivity that tell essentially the same story, and Krugman offers up some explanations. Some other people are talking about "zero marginal productivity" workers, and that makes little sense to me. 1. As one blogger pointed out, the productivity of workers on the job could have risen, as these workers might increase effort on the job in response to the fact that unemployment is now potentially a worse state (expected duration of unemployment has increased), i.e. the cost of separation for a worker is higher. This is the kind of mechanism at work in an efficiency wage model. I'm going to dismiss this, as I don't think it's quantitatively important, but I'm willing to be convinced if someone has evidence to offer. 2. Krugman mentions unionization (and makes a reference to Nick Rowe's stuff), which may have something going for it as an explanation. The degree of unionization in the US has certainly fallen in the post-1990 period relative to the pre-1990 period. However, maybe the effect goes the wrong way. Likely the key effect of unions on how a firm adjusts total hours of work is that a union puts more constraints on how time is used at work, and on the specific tasks a worker can be assigned to. In principle, it seems that if you put constraints on how the firm can adjust the intensive margins of its work force, the firm will adjust more on the extensive margin, and you might then expect a unionized firm to have more variance in employment over the cycle, not less. 3. What could be going on is Schumpeterian creative destruction. Within an industry, the low-productivity firms fail during a recession, raising average productivity in the industry. But what makes the post-1990 period, and particularly this recession, different then? Maybe the financial factors driving the recession give the Schumpeterian mechanism more kick. 4. Maybe we can explain this by looking at the sectoral composition of output. An important difference in this recession is that residential construction declined by a very large amount compared to the typical post-WWII recession, and residential construction presumably is a low-productivity sector of the economy. Further, residential construction has remained in the toilet while the other components of GDP are growing. 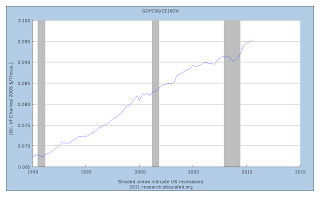 Typically, investment in residential construction recovers before other components of GDP - it leads the cycle. Possibly this can account for the large increase in productivity from mid-recession on. However, the decline in residential construction began long before the recession started, and we did not see an increase in productivity then. Looks like this is a problem that isn't going to be solved in a blog piece, unless someone can shed some light on this for us. In any case, uncovering what is causing the recent productivity increase is very important. For example, if this is Schumpeterian creative destruction at work, then that is cause for optimism, as that would tell us that the increase in aggregate productivity is permanent, and this sets the stage for future growth in GDP and employment. However, if the recent productivity increase reflects only a temporary change in the sectoral composition of output, the effect is only temporary, and we should be less optimistic. "In any case, uncovering what is causing the recent productivity increase is very important. For example, if this is Schumpeterian creative destruction at work, then that is cause for optimism, as that would tell us that the increase in aggregate productivity is permanent, and this sets the stage for future growth in GDP and employment. However, if the recent productivity increase reflects only a temporary change in the sectoral composition of output, the effect is only temporary, and we should be less optimistic." Do you see how hard this is? "Important" and "optimistic"? Doesn't sound like "objective" analysis to me. I'm not trying to "troll" your blog...but the best arguments for my side seem to be the ones you are making. I think my point has been made, and i will refrain from making it again. Steve: when the data we have are consistent with many possible explanations, one good strategy is to widen the data set. Looking outside the US I saw something that really surprised me. Spain had even bigger pro-cyclical productivity than the US. And Ireland's productivity was a bit pro-cyclical too. All the other countries I looked at (the G7) had counter-cyclical productivity. So, I thought, what do Spain, Ireland, and the US have in common? And what makes all three different from the other countries? They don't seem to have things like tight/easy labour laws and weak/strong unions in common. My initial guess was that all three had a big drop in construction. But then Stephen Gordon got data on construction employment, and it didn't fit my theory as well as I had hoped. The ranking in Pro-cyclical productivity was Spain, US, Ireland. The ranking in big drops in construction employment was Ireland, Spain, US. But still, I think we all need to look at more than the US if we want to resolve this puzzle. Putting in other countries with a large decline in construction (Bulgaria, Latvia, Lithuania, Estonia, Romania, Greece) also doesn't work. However. All these countries showed fast growth of labor productivity before 2008 - and lackluster growth or even falling productivity after 2008, while productivity in rich Germany grew again, in 2010 (though there is absolutely nothing even close to the 6% increase in the USA). Anonymous: that's interesting about those other countries. Bang goes my theory. Pity. It was such a lovely theory. But German productivity recovered when it began to exit the recession. So Germany is procyclical, which is normal. "(though there is absolutely nothing even close to the 6% increase in the USA)"
Prof W, what do you think of van Rens and Gali's explanation? "We document three changes in postwar US macroeconomic dynamics: (i) the procyclicality of labor productivity has vanished, (ii) the relative volatility of employment has risen, and (iii) the relative (and absolute) volatility of the real wage has risen. We propose an explanation for all three changes that is based on a common source: a decline in labor market frictions. We develop a simple model with labor market frictions, variable effort, and endogenous wage rigidities to illustrate the mechanisms underlying our explanation. We show that the reduction in frictions may also have contributed to the observed decline in output volatility." Yes, I agree that more data has to help. In this case, I think we need some models too. This appears to require some more serious research than we are going to do here. This is a good entry into the topic. They tell you about the relevant literature, document the facts, and then give you a model to try to make sense of it all. The results are essentially driven by what we measure and what we don't. Labor input can be adjusted on two margins: employment (extensive), and effort (intensive). The firm and the worker can observe effort, but we only see employment. There are costs of adjusting employment (a little bit hokey perhaps) which are in part going to drive the results. Those costs have to be falling over time to explain the data. What's this about sides? What side are you supposed to be on? Right now, this appears to be the silliness side. Another thought on van Rens/Gali: To explain the last year of data with their model would require that workers increased unobserved effort by a huge amount. You would have to give me some other evidence to convince me that this is what happened. If it is truly unobserved, then we're stuck. Steve: "You would have to give me some other evidence to convince me that this is what happened." And, I would add, why it also happened even more in Spain, less in Ireland, and went the opposite way in Canada, Germany, UK, France, Japan, etc. There may be different productivity dynamics in manufacturing and services. A much higher % of job losses came from services in this recession. Is it possible service sector productivity is pro-cylical versus counter- for manufacturing? "Investment" in the service sector primarily involves hiring people ahead of, or to stimulate, demand growth. Eliminate growth, and employment could perhaps decline without much impact on CURRENT output. I believe service sector employment grew even during recessions for most of the post-War era. Thus, due to the strong secular growth of service employment, average productivity during recessions used to be driven solely by manufacturing. This changed in 2001, and even more so in 2007/8. Along the above lines, perhaps a disproportionate number of German job losses still came from manufacturing? anon1: Yes, that's interesting. (i) I think Europe has not experienced the same high growth in services as is the case for the US. (ii) You could tie this in with the old labor hoarding story. Suppose manufacturing is more intensive in firm-specific human capital than is the case for services. Output variance might be higher in manufacturing (particularly in durables) than in services but employment could be more variable relative to to output in services than in manufacturing. Maybe this works in a way that is consistent with the data. What about intangible investment? A portion of the people who were let go by their firms, produced intangible investments (R&D, marketing, and other work that creates future sales), which is not well accounted for in GDP. 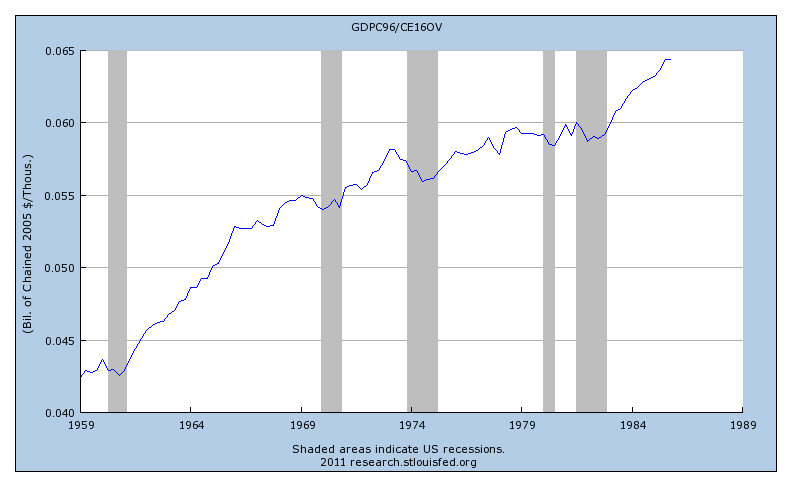 When these people become unemployed we might not see much of a decline in GDP, and average labor productivity increases. Since a larger fraction of people let go in this recession worked in intangible investment services jobs/industries, this could perhaps partially explain the increase in productivity. Is the greater proportional drop in intangible investment explained simply by the fact it is like physical investment, and therefore more volatile than other compenents of GDP? 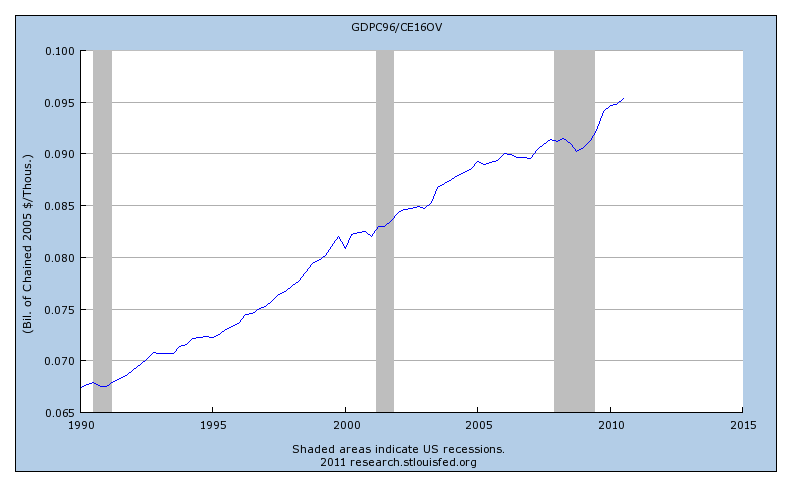 Can we make a case that the fraction of intangible investment in correctly-measured GDP has increased over time, explaining the change in comovements? Here's Simon Van Norden's graph of US manufacturing productivity over the recession, compared to the rest of the economy, to test anon1's theory. I think we don't measure illegal aliens well (in the US), and the drop in construction caused a huge drop in illegals being employed in the cash, mostly non-measured economy. But I don't have any data on this.